BERLIN (AP) -- German Chancellor Angela Merkel brushed aside criticism of her potentially expensive election pledges, arguing Tuesday that Germany can afford to spend more thanks to strong tax income and has to help bolster Europe's economy. The conservative leader's proposals include increasing tax breaks for people with children, pension adjustments favoring mothers who stayed at home rather than working, and spending on transport infrastructure. They drew criticism from the opposition and her coalition partners, the Free Democrats, who favor focusing squarely on cutting debt. Merkel's hard-nosed handling of the eurozone debt crisis, involving sharp spending cuts elsewhere in Europe, has helped her popularity at home. But with their own country's finances healthy, Germans haven't experienced the kind of austerity others in recession-hit Europe are facing. Merkel's government has even increased childcare benefits and abolished an unpopular medical charge. The chancellor noted at a conference organized by Germany's main industry lobby group that her government has cut borrowing over recent years but also saw tax income increase as the country's economy, Europe's biggest, grows. She said that "we have a responsibility to strengthen our domestic demand in view of the very fragile economic situation in the euro area." "We are not just an anchor of stability in terms of the budget but also an anchor of growth in Europe," Merkel said. "That is our philosophy and this philosophy must be continued." Merkel insisted she won't raise taxes — a contrast with the center-left opposition, which wants to make high earners pay more — and intends to start paying off Germany's government debt in the coming years. She argued that the pension changes could be financed from existing pension funds, and pointed to projections that the government's tax take will increase by up to 60 billion euros ($79 billion) over the next five years. 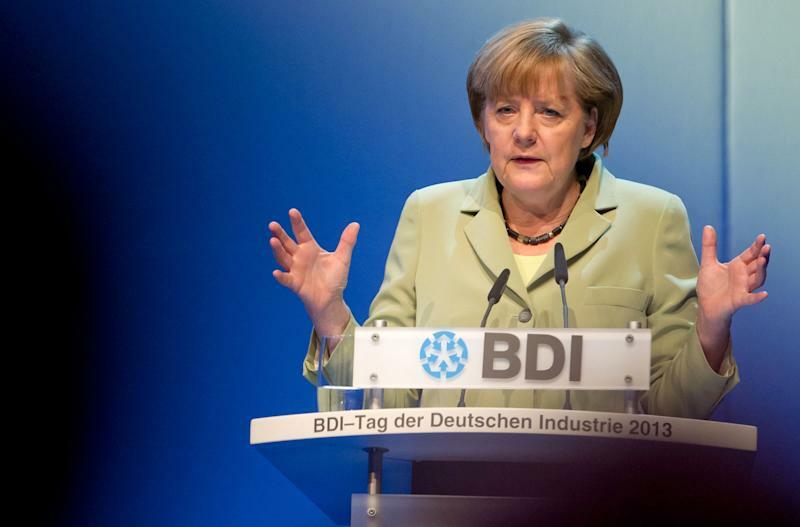 "I can invest that without raising questions over my budget targets," Merkel said. The government plans to get by without new borrowing from 2015. Merkel's Christian Democrats lead polls ahead of Sept. 22 elections, though they show her current coalition with the Free Democrats short of a majority. The Free Democrats' leader, Vice Chancellor Philipp Roesler, argued Tuesday that Germany has to set an example as it pushes for solid finances in Europe. He argued that politicians must "push above all for budget consolidation," and that Germany can only think about how to spend more from 2016, when it has stopped borrowing money.